Join two longtime Island residents for a guided walk through our unique, vibrant community on Toronto Island, one of the city's greatest tourist attractions. More than one and a half million visitors come to the Toronto Islands every year, but few get the "real story" about the people who live here. We're a community of over 650 people who live on the Island year-round, in 252 wood-frame, cottage-like homes on the eastern end of the 825-acre Toronto Island Park. Our historic, 150 year-old community is car-free, store-free, and just a 10 minute ferry ride from the heart of downtown Toronto, the country's financial centre. Let us take you through the community and give you an insider's view . We'll tell you about the joys and challenges of our unusual day-to-day lives, and give you the real story of what it's like to live in a park and run your life by a ferry boat schedule! We offer small-group, scheduled tours three times a week. Private tours can be booked on request. We are experienced tailoring tours to a group's needs. We cater to seniors/retirees, ESL students, history buffs, women's groups, walking groups and photographers. We like to keep group size to 20 or so to retain a personalized feel and allow for questions and discussion. Reduced rates apply for groups. Linda Rosenbaum and Susan Roy are long-time Island residents. We guide your walk through the community, share personal stories about living on the Island, and answer your questions! Regular tours are offered June 2 through September 2018. We limit group size to ensure personalized tours. Tours are $25 CAD per person. Best to pre-book, or meet us at the white gazebo at the Ward's Island ferry docks at scheduled times. We pre-book private and group tours on request, and can tailor them to a group's needs. Reduced rates apply for 15 or more. 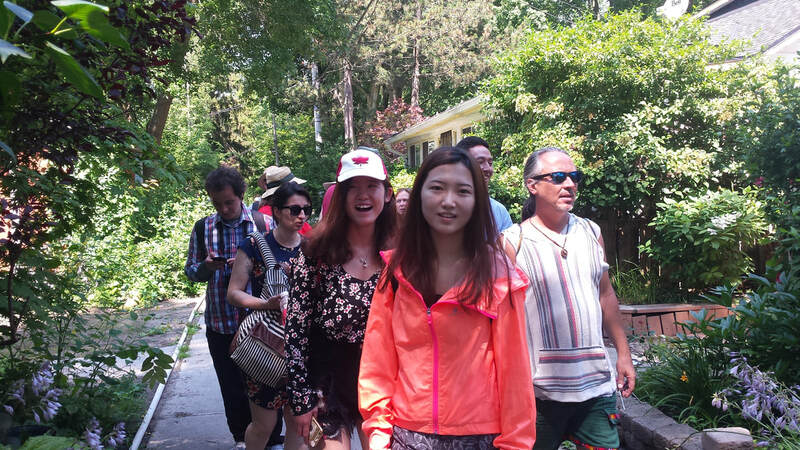 Take a leisurely walk through the Toronto island community with us!